Scientific Machine & Welding, Inc. fabricates custom Industrial Skids with best in industry service and value to our customers. Industrial skids can be used for a wide range of things. They are basically used for housing and transporting a variety of elements, particularly machinery and related equipment. These industrial skids must be built durable in order to withstand heavy loads and must be able to maintain themselves while being transported. It is also important that industrial skids survive in the harsh environments and extreme conditions that they are most often used in. 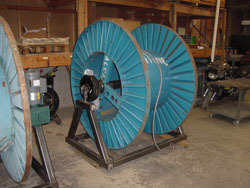 At Scientific Machine & Welding, Inc. we recognize that every customer has different needs for each industrial skid. We work with you, from the design through finished product, to ensure that your industrial skids meet your specific requirements. 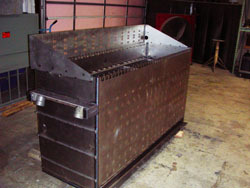 You can count on Scientific Machine & Welding, Inc. to fabricate your industrial skids to your exact requirements with your complete satisfaction our end goal. 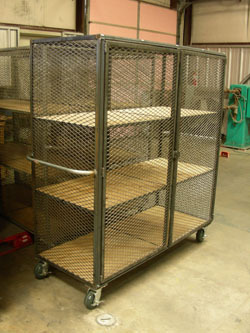 SMW is a leading supplier of shark carts for construction site supplies management.